Grevillea arenaria subsp. 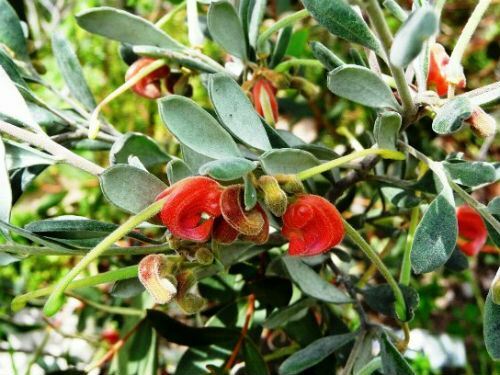 canescens differs from Grevillea arenaria subsp. arenaria (see the article in this series) with the latter subspecies having leaves with a silky undersurface whilst the former subspecies has velvety leaf undersurfaces. There is also some diversity in flower colour and growth habit within the canescens subspecies. Grevillea arenaria subsp. canescens restricted to a height of one metre or less. Leaves are up to four centimetres long, one centimetre wide with the characteristic velvety undersurface. Flowers are yellow to red with a green perianth. The flowers are more prominent than the blooms of G. arenaria subsp arenaria. In both subspecies honeyeaters constantly visit to the flowers. Grevillea arenaria subsp. canescens has a wide distribution within New South Wales. There are populations in central NSW, Blue Mountains and the Southern Highlands. The population in the Gilgandra area, central NSW, is of particular horticultural interest. These plants reach a maximum height of one metre with attractive velvety foliage and well-presented red flowers. Perhaps this population is different enough to be considered another subspecies or even a species in its own right. We grow the Gilgandra form in our cold climate garden and it has proved to be hardy and free flowering. Both foliage and flowers are attractive features. The Gilgandra form is said to sucker. Our plants have not shown any evidence of suckering. This form would make an excellent addition to native rockeries and cottage gardens. The subspecies name means “becoming grey” and refers to the foliage.